This is also watch that I have for over 20 years. It is a Ferrari split second Foudroyante. 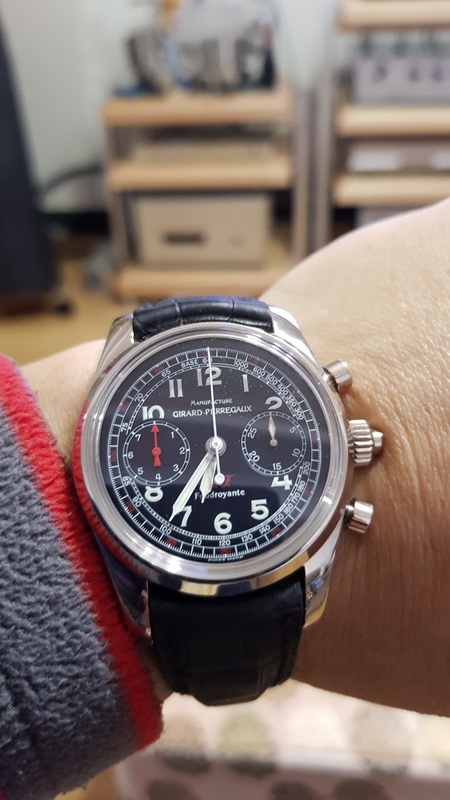 This Girard Perregaux is a 18k white gold case and is made for limited numbers of 150 pieces to celebrate the establish of Ferrari 70th years. The movement was offered to Girard Perregaux, Panerai and Graham. Just to share with all who love Girard Oerragaux. Gp titanium splits a ton of fun! One of my favourite GP..
You have fantastic time pieces ! Bravo ! I adore this very much. This was a pic I took when I 1st got it. Thanks a lot! Especially love those cool blue chrono hands. Done tastefully. Those chrono hands are killer! I like it!! Urban legend says it’s a very fragile watch, is it true? The other happy owners didn’t have any problems either? but I seldom wear it. no more than 5 times, each time less than 30 minutes. And everytime I push the button, the 1/8 second hand works very smoothly. don't worry, lots of people have it and it works just fine. I am recently trying to find the same 1/8 split second movement on Panerai.